So that multiple experiments could be completed in a day, 4 hours was selected as the experiment run time. Each test involved a preconditioning period of the hotbox to account for the varying New England climate, where experiments were conducted, so only to subject the test materials to tropical conditions. Though the box is capable of testing for much longer periods of time, this shorter time allows the user to see quick results which can be used to develop the next design, as part of an iterative process. The experiments shown in this thesis were conducted in a semi-conditioned interior space in Cambridge, Massachusetts between January and May and interior conditions in the testing room varied quite a bit. 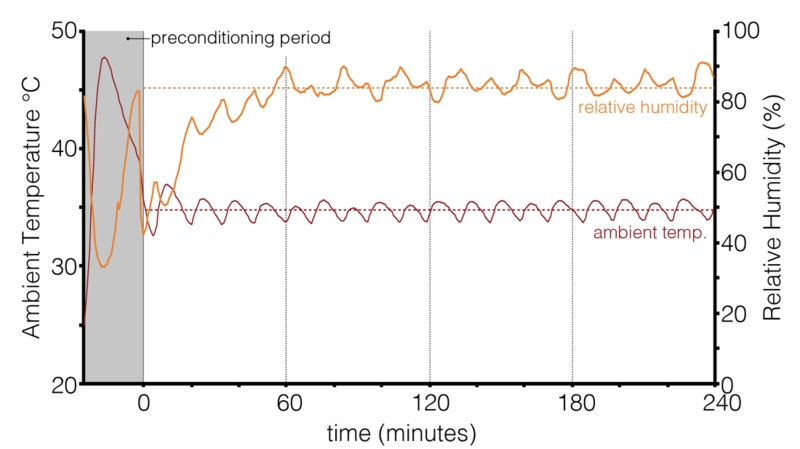 As a result, the amount of time required to achieve steady-state conditions in the exterior box ranged from 30 to 50 minutes. Furthermore, as shown in Figure 1, the heater would quickly overheat to nearly 50°C when initiated. To maintain consistency of results, the test specimen was not inserted between the two chambers until the hotbox had achieved steady state conditions. Instead, the exterior box was sealed with a 2” XPS foam panel during this time. Once conditions were met, the foam panel was quickly replaced with the test specimen. Once the surface temperature sensor was firmly attached to both sides of the specimen, the box was sealed and the 4-hour experiment time began. This transition did release a significant amount of moisture vapor, which usually took almost the first hour of the experiment to regulate to design conditions. As will be discussed in the following chapter, three material groups were tested: concrete, a building membrane, and a selection of porous materials. The second two groups only required minimal preconditioning, meaning all samples were kept in the same room for several days before each test. The concrete, however, required significantly more preconditioning before each experiment to maintain consistency across the results. Especially in the first 28 days of the initial pour, concrete is particularly responsive to ambient moisture conditions. In fact, early experiments with the unconditioned concrete caused moisture levels of the interior chamber to rise even before heat and humidity had been applied in the hot box. Furthermore, each sample gained a significant amount of weight from moisture during the experiments. In response, the samples were desiccated by baking them overnight (16 hours) at 100°C before and between experiments. Figure 2 shows the weight change of four different 2” thick concrete samples that were conditioned within a week of their pour. Unsure of how long to heat the samples, their weights were measured over a one-day period that included the 16-hour bake time. ​Both samples leveled out after 16 hours in the oven, and didn’t see much change, even after an additional two hours in the oven. 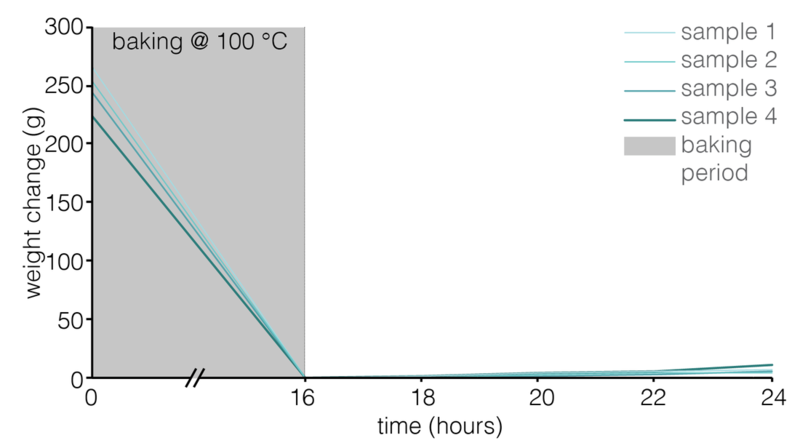 The smallest sample lost 1.84% of its weight after the first 16 hours and only additional .08% after another two hours in the oven. A second sample lost 1.80% and then an additional .13% after two additional hours. Though the extra time did provide for further desiccation, it was determined that the 16 hour bake time was satisfactory to create a reasonable level of control between experiments. Since these samples are used for hygrothermal testing and not for structural purposes, the potential for reduction in strength due to desiccation was not considered. After the baking, all samples were further preconditioned in the same room for several days, without direct sunlight. Weight changes during this time were relatively minor. ​ASHRAE. 2016. ASHRAE International Weather Files for Energy Calculations (IWEC2). Atlanta. Accessed November 22. https://www.ashrae.org/resources--publications/bookstore/iwec2. ​The Engineering ToolBox. “Water Vapor and Saturation Pressure in Humid Air.” http://www.engineeringtoolbox.com/water-vapor-saturation-pressure-air-d_689.html.